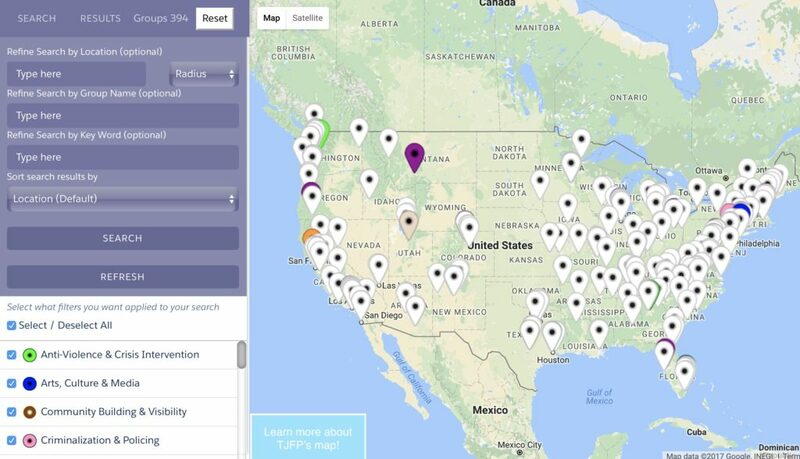 The TJFP Interactive map is LIVE! We are so proud to announce that after countess hours of creation, the TJFP map is finally available! It’s still a work in progress but now TJFP applicants and grantees are searchable by group name, location, focus area, and more. While we have always had a directory available on our website of the many of the brilliant trans justice groups that have applied for a grant from TJFP over the past 5 years, this directory was never a total hit. So over the last year we re-envisioned how we might make a more useful tool and resource for trans justice groups. This map is a list of grassroots, trans-led, trans justice work happening in the U.S. (with their permission of course!). TJFP has always hoped that through this directory of past grantees and applicants, we’d be able to help break down barriers and connect folks to one another. Comments Off on The TJFP Interactive map is LIVE!